After a decade of killings and human-rights abuses, the rebel guns in Nepal have finally fallen silent. The peace agreement reached last week between the government and Maoists, followed by the arms accord signed on Tuesday, constitutes the first real progress towards consolidating a seven-month-old ceasefire. But achieving lasting peace will be more difficult. That will depend on whether the Maoists are truly committed to democracy — and not simply another grab for power. Political crises have been endemic in Nepal, where a series of shaky governments have stunted the growth of democracy since its introduction in 1990. The latest lurch into political chaos was triggered when King Gyanendra suspended the country’s democratic institutions in February 2005, seeking to return Nepal to an absolute monarchy. The mass protests that erupted — with Maoist support — forced the king to cede many of his powers, including military control. As parliament was restored, the new government that emerged quickly opened peace talks with the rebels. Previous peace agreements between the government and Maoists foundered because of poor implementation. As a result, Nepal has suffered gradual state atrophy. Widespread lawlessness and corruption helped vault the rebels into a pivotal role of power, enabling them to run a de facto parallel state in some areas of the country. In barely a decade, the Maoists morphed from a ragtag band of armed revolutionaries, inspired by Mao Zedong’s Little Red Book, into the potent force now standing center stage in Nepalese politics. Having waged a prolonged "people’s war" to overturn state institutions, the Maoists finally agreed on Nov. 21 to join the political mainstream. Their first order of business will be to help draft a new constitution. On the eve of the signing of the peace agreement last week, the rebels’ chairman, known by his nom de guerre, Prachanda, was publicly celebrated as a hero in New Delhi. He now hopes to become the first president of a republican Nepal. India’s interest in Nepal goes back many years. The open, 1,600-kilometer-long border shared by the two countries allows for passport-free passage. 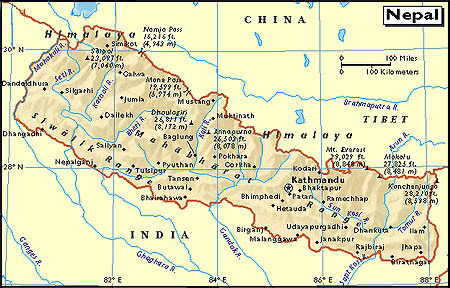 After Mao’s annexation of Tibet brought Chinese troops to India’s frontiers, India linked Nepal to its security system through a 1950 treaty, creating a buffer with communist China. In recent years, India has watched with unease as China used Nepal’s political turmoil to increase its influence there. By brokering this peace accord, India hopes to stem the Chinese tide. The agreement puts the Maoists on the same footing as the government, giving them joint responsibility for enforcing law and order. Under United Nations supervision, the Maoist and Nepalese armies are to lock up an equal quantity of weapons. And as the Maoist fighters are sequestered in special U.N.-supervised camps, Nepalese troops will be ordered to return to barracks. The Maoists expect their fighters to be merged with the official army. India similarly hopes that the Maoists will be absorbed and tempered by Nepal’s governing institutions, but it would certainly not like to see the Maoists call the political shots, given their ideological leanings and cross-border links with Indian Maoists. The deal’s implementation poses major challenges, with the success of establishing an enduring peace hinging on several questions: Will the Maoists abide by the rules of democracy, or try and usher in a proletariat dictatorship? Will they honor the deal by disbanding the parallel administration they run in many rural districts, or continue to levy taxes and mete out savage punishment upon those who fall foul of them? Will they lock up their guns in good faith, or continue to keep secret caches? Most importantly, will they run a fair campaign in next year’s Constitutional Assembly elections, or seek to win the vote by riding on their reputation of violence in the impoverished countryside? The Communist influence will be strong in the new 330-member interim Nepalese parliament, with the Maoists and Nepal’s main communist party holding 73 seats each under the deal. The Maoists have set their sights on winning as many seats as possible in the Constitutional Assembly elections so that the new constitution will bear their permanent imprint. Until then, even as Prachanda has declined to forswear violence, the Maoists intend to exercise power without responsibility, with their top leaders declining to join the planned interim government, lest holding office dull their revolutionary sheen or erode their grassroots base. The ascent of the Maoists carries the possibility of fashioning a "people’s revolution" through constitutional means. But if they don’t succeed in gaining elected power, they may return to their armed revolutionary ways, rather than sit on Parliament’s opposition benches. If that’s the case, then, once again, the peace will be short lived. Mr. Chellaney is professor of strategic studies at the privately funded Center for Policy Research in New Delhi and most recently the author of "Asian Juggernaut" (HarperCollins, 2006).